With the loved one by our side, everyday feels like a beautiful dream. A dream that should never end and keep us from awaking. It is such a beautiful feeling to live our life with someone, who makes this life worth living. So, such a person ought to be given that love and attention in everyday life. And, the best way to appreciate his/her presence in our lives is by gifting something that adds a sparkle in his/her eyes. 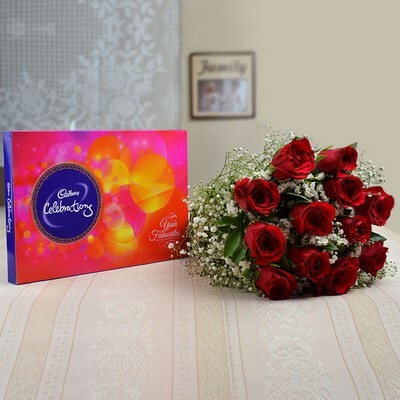 This gift, containing a very delectable box of Cadbury celebrations, coupled with an attractive bunch of 12 red roses, makes your loved ones’ face shine with happiness.